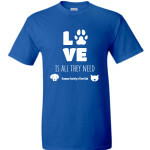 Buy a shirt for the ones you love, and share the love with needy pets! 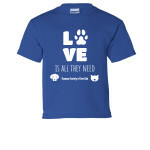 Celebrate the holidays in style with the Humane Society of Live Oak's awesome new tshirt design! Share the love by declaring your love for our animals. Monies raised will go back to our non-profit fund to help needy animals in and around Live Oak, TX. 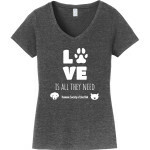 Give the gift of love - buy a shirt today! Orders will ship within 10 business days of this fundraiser ending on 12/16. 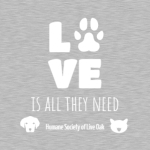 The Humane Society of Live Oak is a community-based volunteer run organization based in Live Oak, TX, on the NE side of San Antonio. We exist to help out with emergency medical cases and finding homes for needy pets in and around Live Oak, TX and of Live Oak Animal Shelter. Share Why You Support Give the gift of LOVE! Be the first to support this fundraiser! This fundraiser doesn't have any supporters yet. Buy or donate now and be the first to support this fundraiser!